The theme of parks for all was especially poignant during the naturalization ceremony. In the shadow of the Golden Gate Bridge, young people from 16 different countries took the Oath of Allegiance, received their Certificates of Citizenship, and were honored for choosing the U.S. They also heard from San Francisco author Dave Eggers, had him sign copies of “Her Right Foot,” and checked out the StoryWalk featuring the book nearby. This is a story about the Statue of Liberty—a symbol of immigration and welcoming in America. 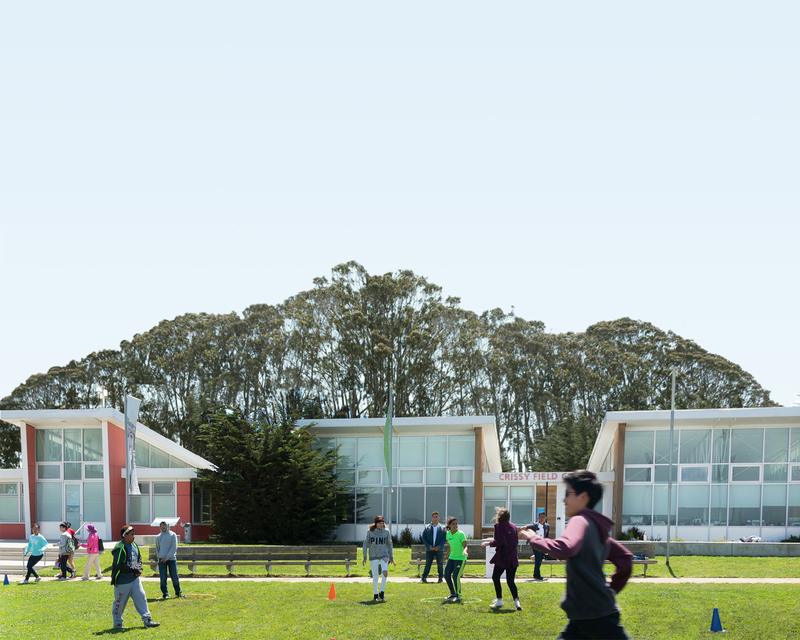 The StoryWalk, a project of the Golden Gate National Parks Conservancy, the San Francisco Public Library (SFPL), the Presidio Trust, and the NPS, connects the Golden Gate Bridge with the Statue of Liberty as welcoming symbols. “Our bridges were built by immigrants, some of our best ideas were born in the minds of immigrants, and this country will only survive if immigrants continue to choose and call the United States home,” Eggers told the crowd in a stirring speech. One of Eggers’ main themes was “the immigration story never ends.” And a stunning number of people in attendance, not just the new citizens, picked up on that thread. Puiyuk Sin, one of several SFPL children’s librarians in attendance, grew up in Hong Kong dreaming of becoming a librarian, and only got to realize her dream after coming to the U.S. at age 17. Jaime Wong, who helped usher in “Her Right Foot” as a marketing manager at Chronicle Books, still remembers the day her mom became a citizen. Wong was in school and sitting in class like it was a regular day, but for her mom it was one of the most special days of her life. The ceremony itself was filled with inspiring moments. The young people were called up country-by-country by Deputy District Director Roland Lyons of the U.S. Citizenship and Immigration Services’ (USCIS) San Francisco District and Field Offices to say the oath, which is the same administered at regular citizenship ceremonies at Oakland’s Paramount Theater. The children then received their certificates, their new proof of citizenship. When a parent naturalizes, their children also automatically become citizens as long as they have green cards and live with the parents.